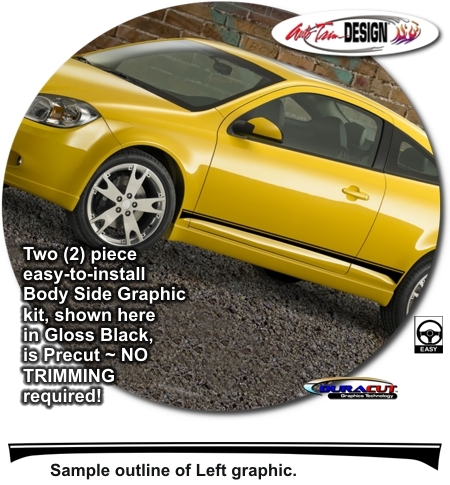 Set your '05-'10 Cobalt or G5 apart from the rest with this classic yet "sporty" Body Side Graphic kit. Available in a wide variety of colors, graphic is packaged with one (1) left and one (1) right side graphic and features a 0.375" (9.525mm) pin at upper portion. Distinct from generic body side graphics, this kit is specifically created and manufactured for the Cobalt/G5's unique lower body contours and is designed to be applied along the indentation as shown. Slight trimming required at doors jambs. Kit will fit Coupe and Sedan models. Installation of this kit may require removal and replacement of existing GM or "SS" factory applied emblems.